A story about losing loved ones. Recorded in frontman Adriaan’s parental home ‘The Dirthouse’. Where the music reflects the black hole of lost. with soccer T-shirts that break stigma's as homosexuality. Read more about this project on I-D Vice. I grew up on a farm and I think it’s wonderful to see how my brother is taking over with his own strong vision. The transformation for the love of nature. I made this documentary especially for the Boeren Drive-in cinema in the harbor of Bommenede Zonnemaire, together with drone pilot Jaap Verseput. Sorry the documentary is in dutch. The fashion industry is – after the energy sector – the most polluting industry and is responsible for 10% of the CO2 emissions. Aside from that, the production of clothing for one household costs a thousand bathtubs of water, and the working conditions in low wage countries are abominable. Preservation, good working conditions, recycling, reuse, and upcycling are therefore trends in the fashion industry. Aside from that, the material innovation of work clothes and sport items is growing through application of smart materials, adding functions such as anti-transparency, medication, anti-radiation, odourless, self-cleaning, fireproof, or shape memory. E-textiles are getting better, because the development is taking place within the fibres. 3D printing is taking off in making accessories, shoes, and even complete outfits. Coatings and prints are not only aesthetic, but also functional, adding waterproofness, fireproofness, or even the ability to generate energy, changing colour or texture, the use of communication, or adapting insulation. Several large exhibition pieces – often never shown to the public before – will be exhibited during the trade fair, showing the visitor a glimpse of the future. During Dutch Design Week 2017, Creative Food Studio and AnoukxVera welcomed spectators to a collaborative exhibition at the VDMA building where they challenged your perception of traditional dining and whereáll your senses were stimulated in a unique way. In this Memory Shopfashion designers, chefs, graphic designers, interior designers and ceramicists joined forces to bring your experience of dining to a higher level where curiosity, enthusiasm and marvel carried the upper hand. This experience could even be taken home, because all exclusive designed items in this Memory Shop werefor sale during the exhibition and are now available online. Next to the exhibition, an exclusive gastronomical 8 course food experience took place during the Dutch Design Week where quests were explorers that experienced how the boundaries between food and design faded and the two components merged to form a visual spectacle. Fluid Fire, Green Screen Square and Pastel Pastry Club; the culinary language on the plate was shaped by the unique alphabet of 15 local designers, most of them recent Design Academy graduates. Their motto: “Teamwork makes the dreamteam”. 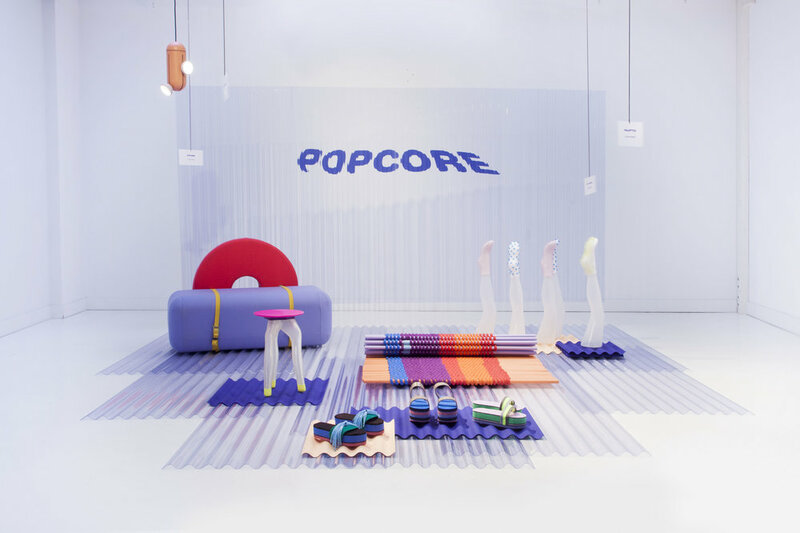 Popcore is a programme of awe-inspiring events - founded by a diverse group of young talents - that aims to create a more elaborate view on the young designers notion. With a background in design, this assembly of creative minds uses the medium to create a contemporary work attitude that radiates more fluidity, playfulness and freedom. Taking a stand against overproduction of clothing items, the AnoukxVera factory presents a teeny tiny world where an on-demand production line starts where ingredients blend as if preparing a fluffy bread. Under the watchful eye of the puppeteers, the creators, the cooks of this collection, a piece of clothing is fabricated only when there is a need for it. The collection is accompanied by a colorful surrealistic movie where we see dancing fingerstamps, boiling blue color baths and wobbly ingredients are representations of a colourful world that doesn't necessarily bears a relationship to a current reality, but aims to shake it up by diving into a chaos of possibilities and surreal sceneries. 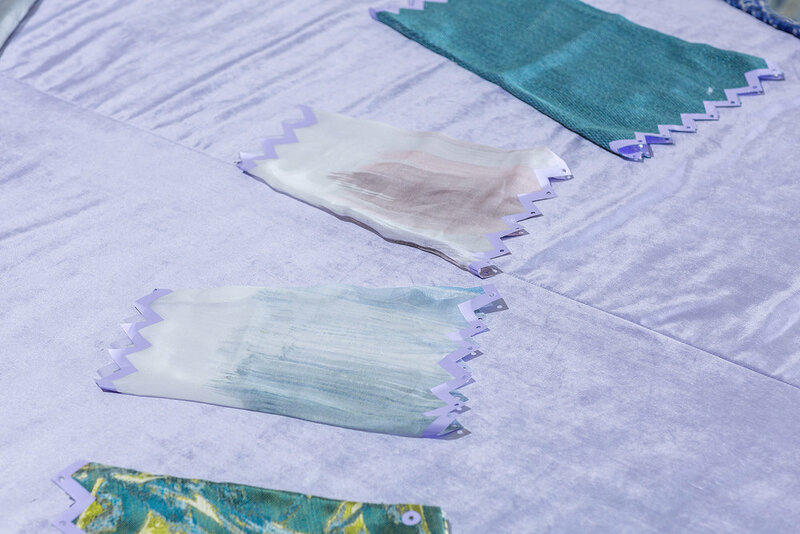 They stretch the fit with a fingertip, change the materiality of a product by simply cooking it and smart inks fuse with the textile in a preprogrammed pattern. These futuristic sportswear lovers prove that on-demand production can be colourful and fun, silly but serious, and that radical changes in the fashion industry can start with a teeny tiny first step. Take a turn on our fashion carrousel! Installation design in collaboration with Grietje Schepers and Harm Rensink. Modebelofte, meaning 'fashion promise' in Dutch, is an international platform for fashion talents. With their annual shows the Modebelofte aims to challenge the fashion industry by presenting a selection of innovative talents and graduates from international BA and MA courses. "Inspired by the Vinticious Version of All is Dull I created an atmospheric video to visualize the feel of the song.